I apologise for keeping on one track in my posts this week but I am preoccupied by events of the last week. I’m not the same person I was a week ago. Some of the pillars that I held on both tangible and intangible have gone now, never to be replaced. There is so much I’m angry about. I’m angry that our ‘so-called’ leaders were all absent and seemed happy to let Tottenham burn, only coming home when the violence spread. Tottenham, the patter and media seem to imply is a ‘place like that’. It’s not like Ealing or Clapham or Croydon. There is a lot of ugly rhetoric that has been stoked by the government too. The blame is afforded to poor parenting, poverty, gangs – all, of course, present in places like Tottenham and making easy armchair sociologists of us all – myself included. The truth is far more complex though as the cases coming through the Magistrates’ Courts testify. It was obvious from Saturday that the situation was exacerbated by opportunism. Police ‘engaged’ in one area left other areas open to be looted pretty much at will. This ‘model’ spread around London and around the country. Is it a coincidence that the increase in policing came when the ‘leaders’ returned? I doubt it. As for those following the story, the Guardian are updating lists of those cases brought up to the Magistrates’ Court. It will make for interesting reading but for me, for the moment, it’s all a bit raw. The push towards taking away council housing and ‘benefits’ from people found guilty of looting or rioting is ignorant beyond belief in my very humble opinion. Housing isn’t a treat to be dangled in front of ‘poor people’. It is actually a basic right so is the ability to live in a dignified manner. And what about those ‘rioters’ who live in private housing? Or is there an assumption that it must have been ‘poor people’ in ‘council estates’ who caused the trouble. It is easy to paint broad brushes and make easy judgements – so long as they are judgements made by ‘other people’. Our minds need to simplify often complicated issues but there’s a danger in jumping to conclusions that can be wholly damaging. My concern is that that’s exactly what the government have and are doing. One word that has come up a lot in the last few days are discussions about communities. Whether is it ‘affected communities’, or ‘community leaders’ or ‘rebuilding communities’ and it has made me wonder about what the meaning of the word is. Also in terms of the work I do, I think about the word and the way it is used in the personalisation agenda about ‘building community capacity’. The government uses community in terms of the ‘big society’, volunteering, giving power to communities, but they don’t really explain exactly what this means excepting the idea that ‘community’ is somehow a Good Thing. Strong communities are good. So what is a ‘community’? This is the definition given on Dictionary.com. 2.a locality inhabited by such a group. The first two definitions base the term on a geographical location. Your community is the people who inhabit the world around you. The community might be all the people who live within this local area or it might be people of a specific cultural/historical heritage who live within this local area. I wonder if the idea of splitting apart ‘community’ on the basis of cultural heritage is helpful sometimes. What is clear is that the meaning of community is very different in Tottenham from how it is in Chipping Norton. 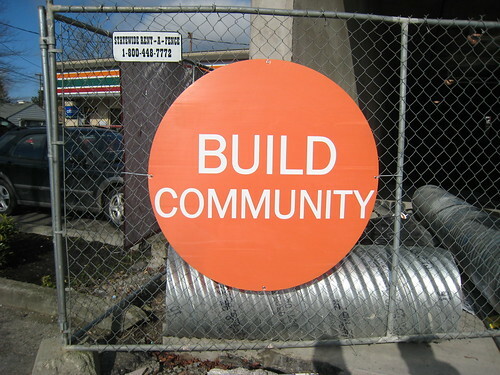 The word is used in the context of building communities ‘online’. Obviously that comes under the third part of the definition. A community exists within a forum or even within readers of a blog. A community can be a Facebook group or a Twitter stream. We can belong to a range of communities. Some communities though, take more effort to join and be a part of than others. Some communities we are born into by virtue of location and/or culture and history. Some communities we move into through geographic location. Some communities we actively choose to join. The government talk about community as if it is the answer to every solution but I wonder how they feel the answers will come in areas where communities are not as cohesive as they know and are used to or not as homogenous in nature. This is a part of the detachment I feel of the government from the people who are governed. 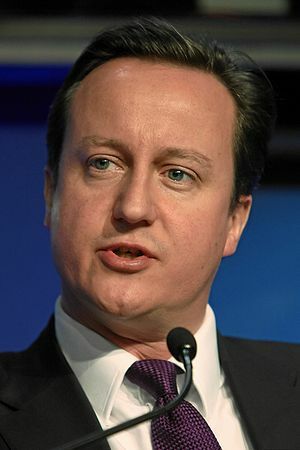 Cameron’s ‘community’ doesn’t feel and look like my ‘community’. My community has different needs and concerns. My community doesn’t have the resources, either in time or money that his community does. What gives some communities more ‘value’ than others? That’s the question that I ask myself frequently. When government leaders seek out ‘community leaders’ do they prescribe value to the communities on the basis of the loudest voices or the largest numbers? Are those who are isolated or who don’t have families or voices detached from any kind of community? I suspect they are and sometimes people don’t want to be a part of a community. Community is always seen in terms of being a good thing, but the people involved in the riots and mass destruction across London as well as other cities, they were part of a community too. Why is community always positive? Perhaps because the experiences of those who ‘rule’ is that they come from communities, yes, that word again, where there is hope and aspiration. Communities can drag people down as well as pull people up and when we talk about ‘community building, we can’t ignore the uglier aspects of some communities. As Cameron talks of ‘pockets of sick society’, I think we know where he is pointing the finger. He is pointing the finger at ‘other communities’. He is pointing the finger away from himself and people like him. This is not his problem because this is not his community. Are those ‘pockets’ communities within themselves? It seems to me that they are and there needs to be a recognition that community is far broader in scope than the ‘let’s all help each other’ model. The sooner we broaden communities and build communities across economic and cultural lines the more we improve society. If we, like the Prime Minister states, see this as a problem with ‘pockets of a sick society’ we isolate and abandon those elements and detach them from our own more mainstream society. The sickness of society is that there are ‘pockets’ within it. This is not simply about poverty. This is about the difference between building exclusive and inclusive societies and yes, communities. Communities have to reach out and build bridges across them. We have to build more inclusion. We have to take responsibility and those that wish to push us into communities have to understand better the way the networks are interdependent. My community is hurting. The only way I can see to rebuild it is to involve myself in it. If anything indicates that there is a role for more macro social work. A role for community work but an inclusive type of community that doesn’t self-select and is able to reach out to those who might not naturally seek to be a part. I have felt fear this week, in a way I haven’t felt fear before. I’ve also felt anger and sadness. Now, I’m trying to find hope and I have and I will. But I still despair of the politicians who purport to ‘lead’ us and the desperate isolation and detachment I feel between my world and the world I see and the worlds in which they move. Community has a better hope of existing when some of the barriers between ‘us’ and ‘them’ are challenged and broken down. That’s the real challenge for communities in these days ahead of us and we can no longer leave it in the hands of detached politicians who live in their own privileged communities. We need to build. As the world moves on to the next News story, those of us left need to hold our attention on those around us and see what we might not have seen if we didn’t choose to look. So what does community mean for you? Is it a useful word or has its lost it’s use through overused dullness? I’d be interested in the responses because it’s been vexing my mind for a while.